The parents of a newborn girl who doctors declared “dead” but who later started breathing on her own are rejoicing today in Halifax, Canada. The mother of the little girl is thanking God and calling what transpired a miracle. Robin Cyr’s fourth child became wedged in the birth canal during labour Saturday and for 25 minutes after she was born, doctors and nurses watched for any sign of life, the Truro Daily News reported. Seeing none, the baby girl was removed from the room at the IWK Health Centre. Cyr said her aunt was in the room and started praying. About two minutes after the little girl had been taken out of the room, a nurse came back in. “She was speechless and another nurse came over and said, ‘Your baby’s breathing,’” Cyr told Metro. The doctor had no explanation, Cyr said. 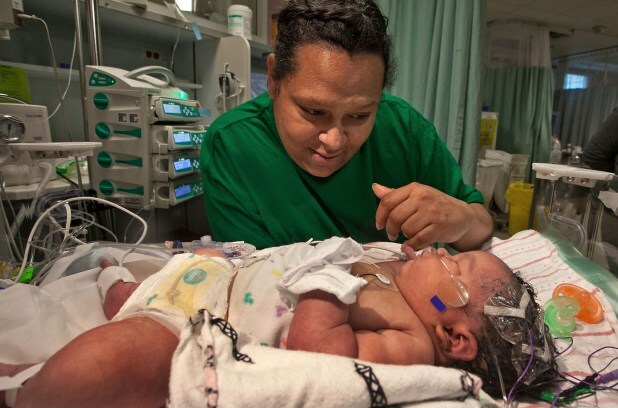 The big baby girl – who weighed nine pounds 14 ounces – got wedged in the birth canal during the delivery. Once she was born, Cyr lay on the bed waiting, for 25 minutes, for any sign of life.